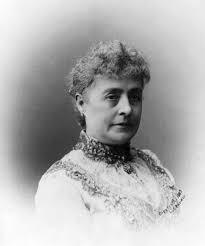 Three First Ladies died in the White House, Letitia Tyler in 1842, Caroline Harrison in 1892 and Ellen Wilson in 1914. It was not until after the first one had died and just before the second and third died, however, that the public learned of the loss within the presidential household. Throughout most of presidential history, the true state of health of the nation’s leader was often kept hidden from the media of the day, and thus the public, largely for political reasons. The idea of a weak Chief Executive, he and his political circle would fear, would lead to challenges of his political power by the opposition. It could also potentially spread a degree of national fear and hysteria that could destabilize the American economy. When it came to their wives, however, the issue was largely one of propriety, the idea that public discussion of anything physical about a woman, let alone one who held a position that was imbued with the symbolism of the highest social status of the nation. It was only when, in the expectations that a presidential spouse would appear in public and endure the physical rigor of performing as hostess in the White House, that there was anything remotely resembling public disclosure about chronic health conditions of First Ladies. In many respects, those First Ladies who had chronic conditions that were not fatal ended up becoming more honest about the true state of their health. In some ways, simple confirmation of the health conditions of nineteenth century presidential spouses, without great detail, were more direct and honest than those who followed. 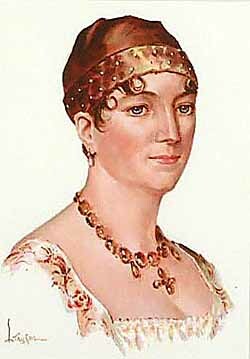 As early as the eight-year tenure of Elizabeth Monroe, from 1817 to 1825, the public were informally informed of the fact that the First Lady was not in robust health simply because of the presence of her adult daughter Eliza Hay at public entertainments either in support of her mother as hostess or substituting for her. What not even those close to Mrs. Monroe, outside of a circle of about a dozen family members including her two daughters, sons-in-law, sister, nephews, and nieces, is that she suffered with symptoms associated with what was then called “the falling sickness,” a euphemism for epileptic seizures. The first death of an incumbent First Lady naturally made the newspapers of the day, but within the news stories were the most specific references made to that point about the facts about the poor health that had impaired her ability to assume a public role. The Camden Journal printed on September 21, 1842, from an original news story that appeared in the Madisonian newspaper of Washington, D.C. even went into great detail on her funeral and the effect on the family, an early and rare example of media and public intrusion into the private life of a presidential family. Some historians later cast doubt on the claim of uncertain health of Peggy Taylor, suggesting that it was a false story put out by the White House because this First Lady did not want to assume a public role. This did not negate the fact that it was true that she did not wish to assume a public role, a condition that her poor health gave further rational. 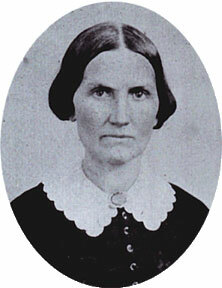 Interestingly, the scant national news coverage of Mrs. Taylor during the year and a half of her husband’s presidency did not make reference to her health or even slightly suggest what was wrong with her, except for mention of the fact that she sought refuge from Washington’s heat at a cool natural spring spa. 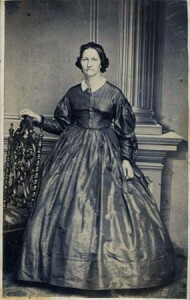 The worst that ailed Abigail Fillmore was reported to the public as a poorly healed broken ankle, preventing her from standing for lengthy periods on the reception line at the public receptions. Since the November 25, 1850 New York Herald cast the presence of her daughter Abby Fillmore as a supportive role who “sustained her mother admirably” rather than ever being a substitute for the president’s wife, the First Lady was perceived to have been in robust health. When, however, just days after her husband’s administration ended and the former First Lady seemed to linger for an unusually longer period of time in her capital hotel room, the press felt free to fully detail her slow demise to pneumonia. 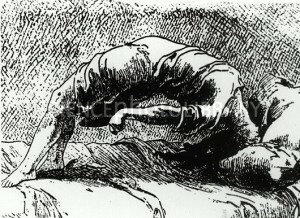 Had this occurred just days before the Fillmore presidency had concluded, it is difficult to judge whether her deteriorating physical condition would have been so aptly chronicled or if the era’s usual propriety about revealing such personal facts about the private life of one with the highest status would have prevented it. A stroke or pneumonia were common enough among families that many Americans considered vulnerability to either condition to be somehow acceptable, whereas other chronic conditions such as cancer or tuberculosis carried a stigma and thus an especially indelicate fact to publicly state about a President’s wife. 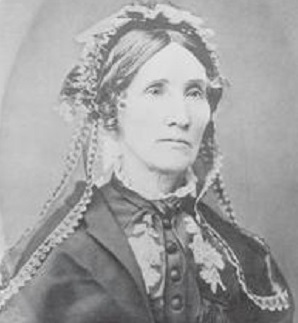 When her husband was first nominated for the presidency in the summer of 1852, any mention of Jane Pierce almost always described her as being ill or in unpredictable condition. Media coverage of her over the course of the presidency that showed she was well and then, without warning, not well made clear that she suffered from some type of chronic, rather than fatal illness, but there was no mention of the word tuberculosis or even references to her occasional diffuculty breathing or any lung trouble. 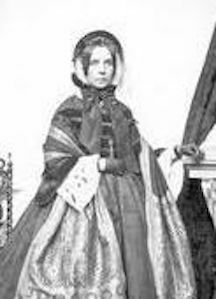 Eliza Johnson’s physical frailty and thus inability to “do the honors” at the White House when she and her children joined President Andrew Johnson on June 19, 1865 proved worthy of public reporting as a way of explaining why her daughter Martha Patterson would substitute for her. 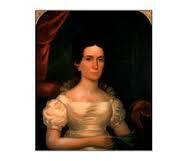 Within just a few short weeks of becoming First Lady in 1881, Lucretia Garfield was hit by a bad case of malaria. From the moment she had to absent herself from public receptions, the White House issued daily reports on her condition. While it did not go into great details, the press releases issued by the presidential physician on duty, did include her temperature and level of discomfort all the way through her eventual recovery. It was a turning point in terms of not just media coverage of illness in the White House but of a woman in the public eye. Yet the Garfield situation proved to be an anomaly, rather than being used as a precedent by either the White House or the reporters who covered it. 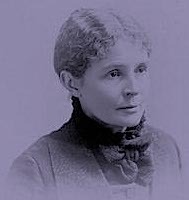 One may speculate as to why it was that Caroline Harrison’s cancer did not become public knowledge until she was on her death bed in October 1892. The fact that it was a fatal condition was surely a consideration, an effort to preserve the privacy of the family for as long as possible as it prepared for her loss. On the other hand, it is unclear how much advance notice the President and his family truly had to realize her death was inevitable. Nevertheless, when this second First Lady to die in the White House occurred, it rated as front-page news stories. 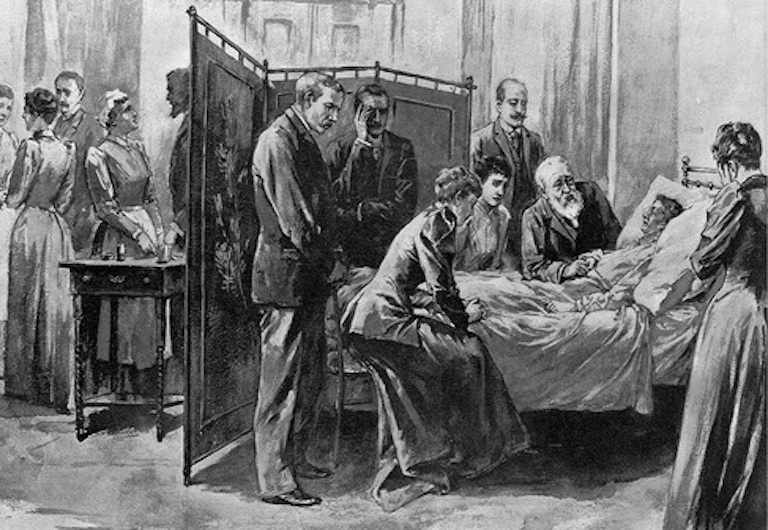 Another turning point in First Lady history was the fact that one of the weekly illustrated newspapers, Leslie’s had even seen fit to depict the sick woman on her deathbed. (see the lead image at top). 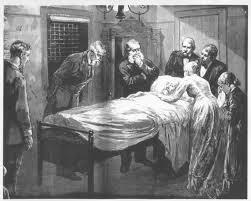 It was not something that had been done eleven years earlier when Mrs. Garfield was quarantined to a White House sickroom, although there were numerous images printed of her at the bedside of her husband as he struggled to recover from the bullet wounds that eventually killed him. As the nation entered the 20th century, there would be more enlightenment about the nature of many perplexing illnesses that affected women. Yet, just as the role of First Lady is one defined by highly personal criteria, so too would be the policy about releasing information about such a personal issue as their health.